Bianca Gonzalez is a proud ChocoRollic ! How do you enjoy your favorite chocolate roll? Do you like to dip a finger to get the first taste of the decadent icing? Do you savor the cake until its last slice? Or, like Bianca Gonzalez, do you go for the sweet milk-chocolatey toppings first? If you do any of the above, you are a certified ChocoRollic! Just like Bianca, a true ChocoRollic is someone who just can’t resist and get enough of Red Ribbon’s Triple Chocolate Roll. This addiction manifests in three distinctive characteristics which all certified ChocoRollics can identify with; a topping snatcher can’t help but pick the delicious toppings of the roll, a finger dipper loves the luscious milk-chocolate icing, and lastly, a cake sweeper will literally sweep up the cake to the very last milk-chocolatey chiffon crumb! It is the ultimate chocolate roll that is simply irresistible and will surely bring out the ChocoRollic in everyone. Even Bianca Gonzales, as seen in her Facebook and Instagram posts, can’t get enough of her favorite chocolate roll, enjoying the pure milk chocolatiest cake just the way she likes it. 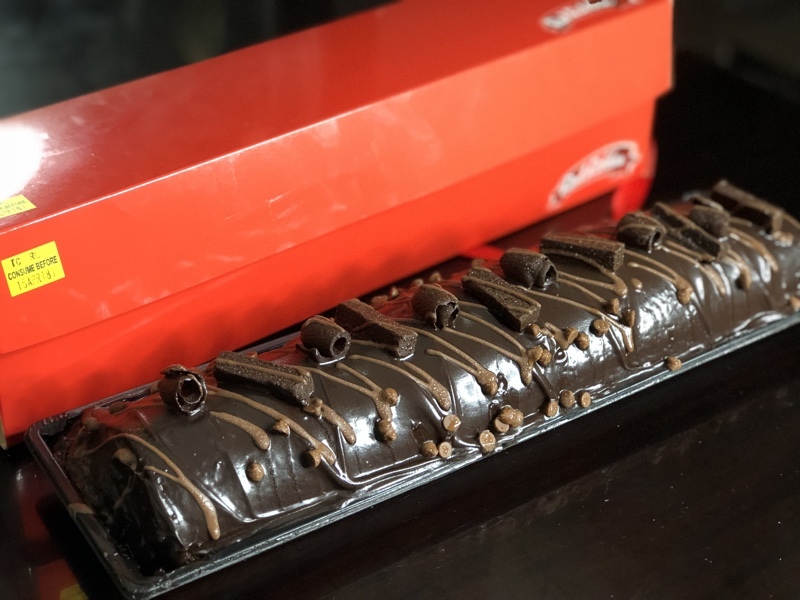 Red Ribbon’s Triple Chocolate Roll is truly the ChocoRollics’ Choice! All this chocolatey goodness can be experienced for just P300 for the full roll and P200 for the half. So the next time you’re looking for a delicious chocolate fix, head to the nearest Red Ribbon Bakeshop, or visit redribbonbakeshop.com.ph to discover more of their delicious cakes and pastries. ever since im a Chocoholic, lalo pang sumarap ng maging Triple Chocolate ang dating simpleng cake. Salamat sa Red Ribbon at hindi ako magsasawa sa cake nyo. My favorite, super chocolatey and always simot kapag ito ang cake sa bahay. Wow..chocoholic here for my stress reliever. favorite brand Red Ribbon and my favorite cake flavor is Chocolate hmmmm super yummy :p i love to eat the toppings first. super love chocolate cake of Red Ribbon actually my son too hehhe naku love namin na kunin choco icing nya using finger hehhe sarap. i want din every bit ng cake may choco icing para feel na feel mo yung sarap ng cake pag ganun hehhe. Wow,my one Favorite cake Triple Chocolate Roll super addictted kahit ung nsa gilid gilid sinisimot ko hehe super yummylicious..
Pioneer DIY 2018 Planner + Giveaway! Anne Curtis K-beauty launch party!